Popular culture is awash with discussions about the difficulties associated with being a man. Television talk shows, media articles and government press releases discuss not simply the problem of men, but have more recently focused on the problems of being a man. The Conundrum of Masculinity challenges highly advertised beliefs that men are in crisis and struggling to hold onto traditional masculine habits whilst the world around them changes. Indeed, whilst there is a range of valuable contributions to the field that examine how men live out their lives in different contexts, there are few accounts that examine in detail the building blocks of masculinity or how men are really ‘put together’. 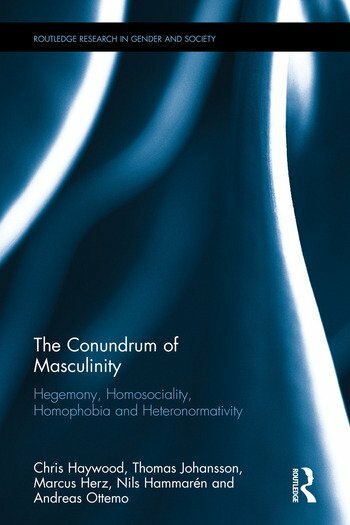 Thus, this innovative and timely volume seeks to provide a systematic exploration of the different aspects of masculinity – in particular hegemony, homosociality, homophobia and heteronormativity. An original approach to the field of masculinity studies, this book ultimately presents a critical synthesis that brings together disparate approaches to provide a clear and concise discussion to address the true nature of masculinity. The Conundrum of Masculinity will appeal to undergraduate and postgraduate students interested in fields such as Gender Studies, Masculinity Studies and Sociology. Chris Haywood is a senior lecturer and Director of Research in Media and Cultural Studies at Newcastle University. Thomas Johansson is Professor of Pedagogy with specialization in Child and Youth Studies at Gothenburg University, Sweden. Nils Hammarén is an Associate Professor of Child and Youth Studies in the Department of Education, Communication and Learning at the University of Gothenburg, Sweden. Marcus Herz is a Senior Lecturer and Researcher in Social Work at Malmö University, Sweden. Andreas Ottemo is a Senior Lecturer at the Department of Education and Special Education, University of Gothenburg, Sweden.